Our daughter Eleanor entered the Paris Marathon, giving us a good excuse to have a long weekend in Paris in the Springtime. 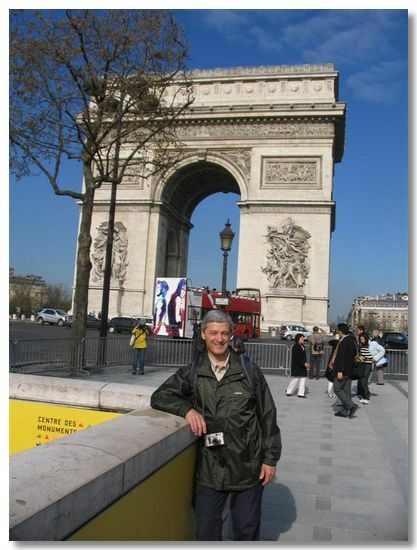 The start and end of the Marathon was at the Arc de Triomphe - the world's largest roundabout. We stayed at a charming nearby hotel. Shame about the tiny bedroom. The Eternal Flame under the arch of course is not that eternal. As most sports fans know, it was "doused" in 1998 by a drunken Mexican football fan relieving himself. Imagine the damage to Franco-British relations if the culprit would have been English! 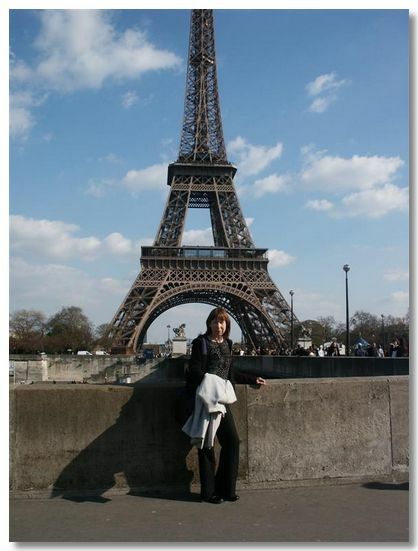 The ubiquitous Eiffel Tower in the background. It is still impressive and stylish, no matter how many times you see it. The almost obligatory "arty" shot of the Eiffel Tower structure. 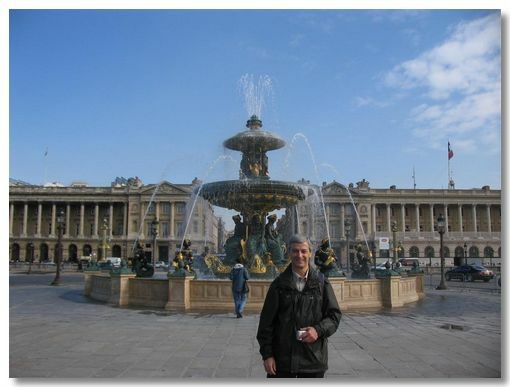 The Champs-Elysees runs between the Arc de Triomphe and the spacious Place de la Concorde. 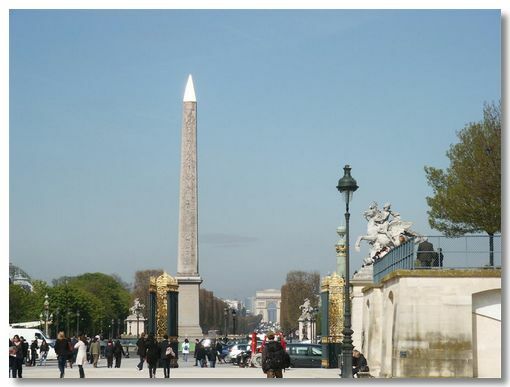 The obelisk along with its sisters, now in London's Embankment & New York's Central Park are some 3,500 years old. 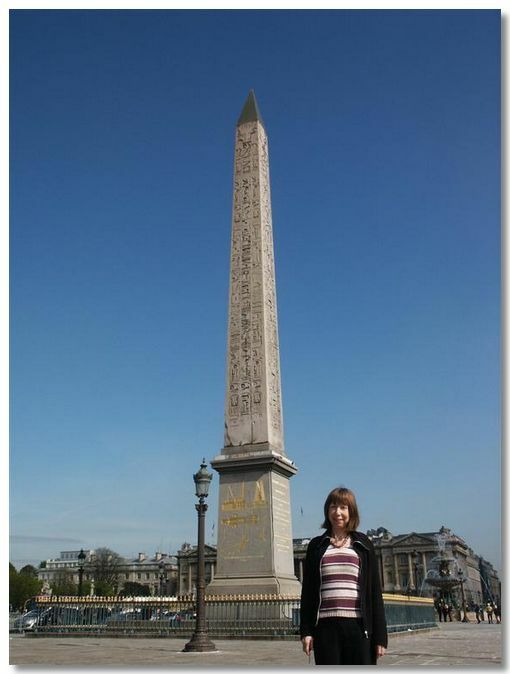 Ann in front of the Obelisk. A beautiful sunny day in Spring - perfect for us tourists. It was here that someone tried the Found Ring Scam on us, but to no avail. It sounds silly, but is apparently often successful. If you don't know about it, it goes like this: a man suddenly bent down in front of me and "picked" up a "gold" ring, asking if it was mine and tried to give it to me. In this case it was as far as he got as we kept on walking with Ann telling him firmly "Non!". Otherwise you end up with a worthless copper ring and you get asked for something in return, often with a sob story thrown in for good measure. Apparently lot of tourists have parted with a lot of Euros with this scam. 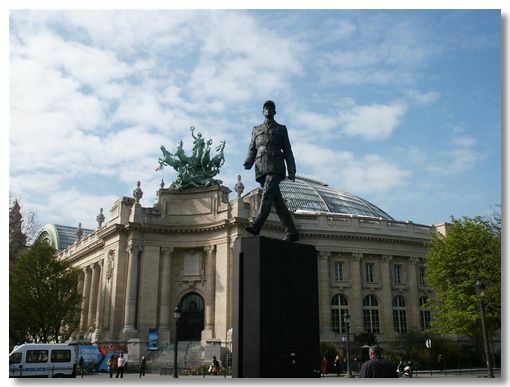 I thought this a striking statue of Charles de Gaulle striding down the Champs-Elysees. 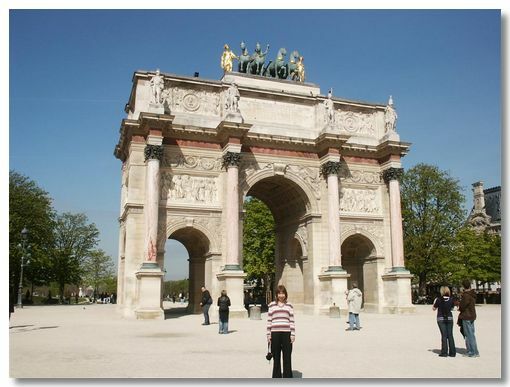 The smaller Arc de Triomphe is between the Tuileries and the Louvre. 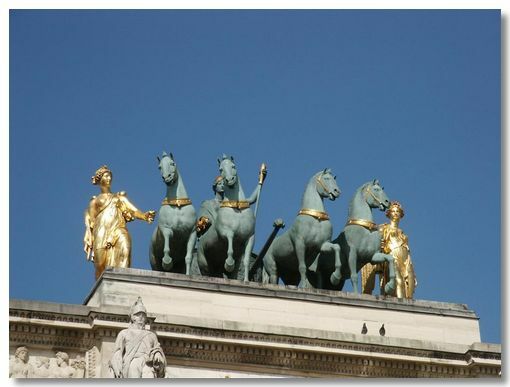 The original four bronze horses were taken by Napoleon from St Mark's in Venice. Needless to say after his downfall, Venice got the originals back and these are copies. 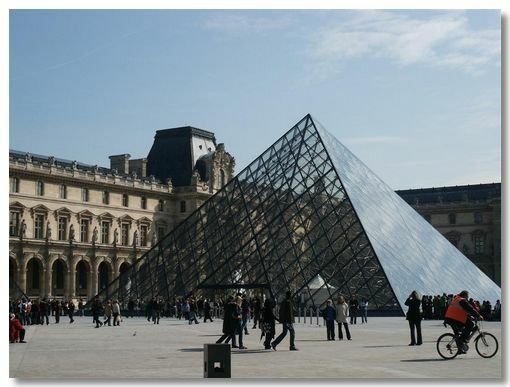 Ann thought that Pei's Pyramid entrance totally out of place within the Louvre buildings. I thought this structure made a simple bold focus as an entrance to the museum. 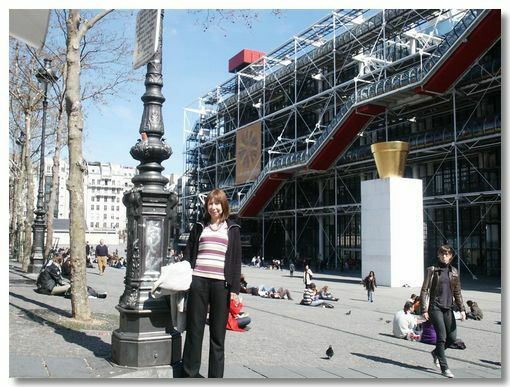 We would have loved to have had time to explore museum, but out of the question as we only had a weekend in Paris. This work is more impressive outdoors than when it was in the Tate's Turbine Hall. It is 30ft high, but somehow appears much more massive. A great space to chill out watching the street artists performing. .... but the views. 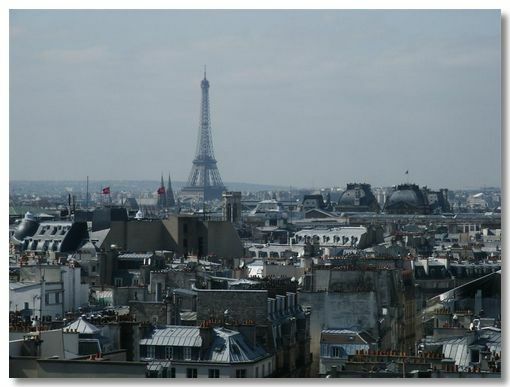 Possibly the best views of Paris are from the top of the Pompidou Centre. 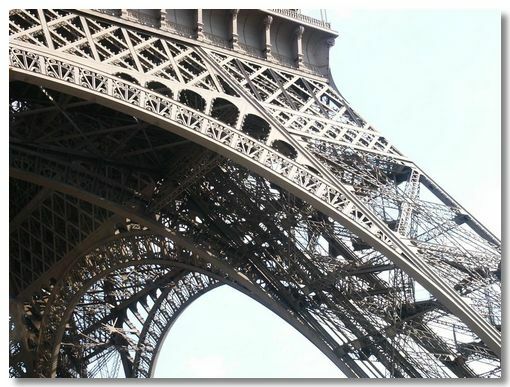 The Eiffel Tower can be seen from most areas of the city. 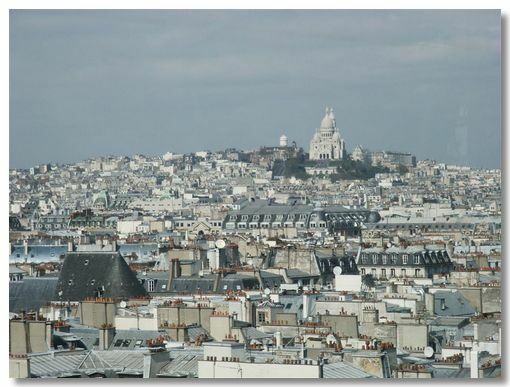 To the north is Montmartre with the gleaming Sacre Coeur. 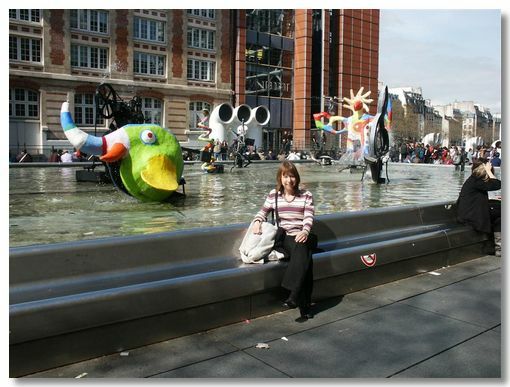 Just by the Pompidou Centre is this charming fountain with mechanical sculptures by Tinguely. He obviously had a childish sense of humour throughout his life. 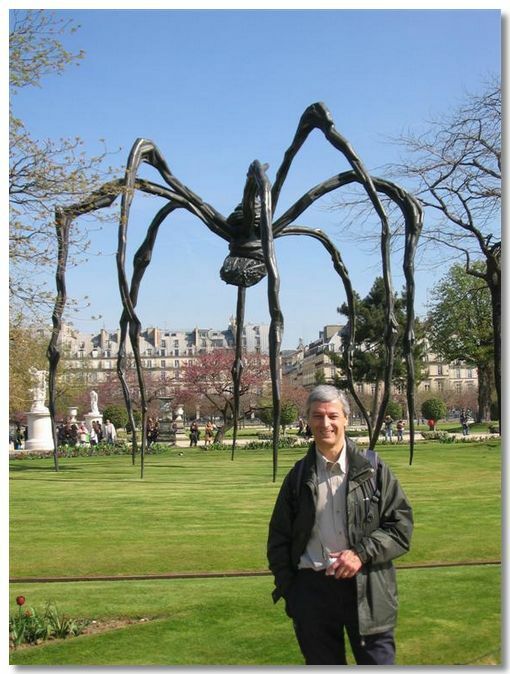 This installation was completed a few years before he died. When we were last in Paris, in 1980, this area was a massive building site. 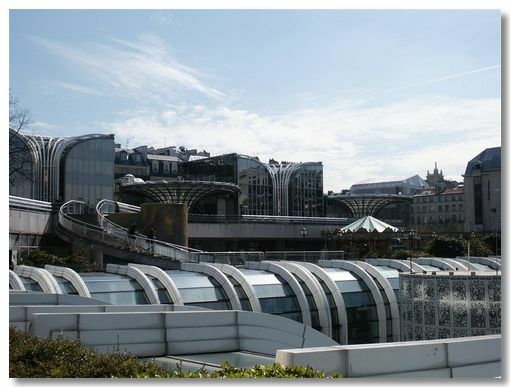 Now it is a massive multi level rambling shopping complex. It is very disorienting. Best avoided unless it is raining.